My church serves breakfast/snack between services every Sunday. All the Sunday school classes take turns bringing in food, which means that it’s my class’s turn roughly every 6 weeks. One time we got all fancy & made hot food – with chafing dishes & everything! However, usually we try to bring cold/room temperature foods, which makes getting creative difficult. We usually end up with a lot of dessert type foods – cookies, pastries, etc. Beth sometimes makes these amazing homemade donuts. She’s famous for them at church! Recently it was our turn again & I wanted to make something different. Don’t get me wrong, I love eating cookies any time of day. But I wanted something with a little more substance. 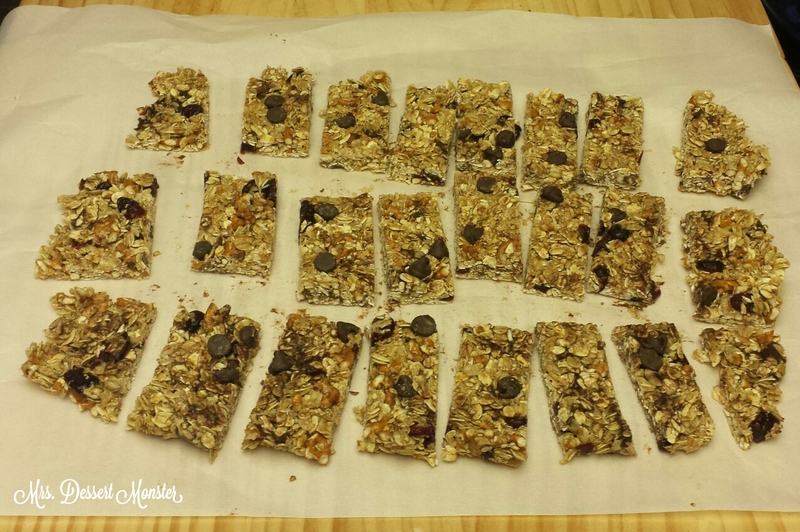 Suddenly it came to me – granola bars! Yes, they can still be pretty sugary (& mine kinda were), but granola & dried fruit say ‘breakfast’ a little better than cookies. This was a really easy recipe to make. As usual, I was looking for a recipe online & wasn’t satisfied with my search results. So I got some ideas from various recipes & made my own! Honestly I’m not sure where the idea to put pretzels in them came from. I’ll just chalk it up to divine inspiration. I need to start putting pretzels in more things; the results are delicious. Cranberries were an easy decision, though. Why have raisins when you can have craisins! And chocolate because, duh. I was so focused on making these that I really didn’t take any pictures until the very end. Oops! But the steps are so simple you don’t need to follow the play by play. Once you toast the oats, melt the butter, & mix everything together, you just press it into a pan & chill it in the fridge until you get one giant granola bar. Then just cut it up & serve! These were so good that I made a double batch & still had to control myself from eating it all! I think granola bars are my new go-to for church breakfasts. In a 9 x 13 inch pan lined with parchment paper, toast oats in the oven set to 350 for 7-10 minutes. Transfer to a large bowl. Melt butter & combine with sugar, honey, & vanilla extract. 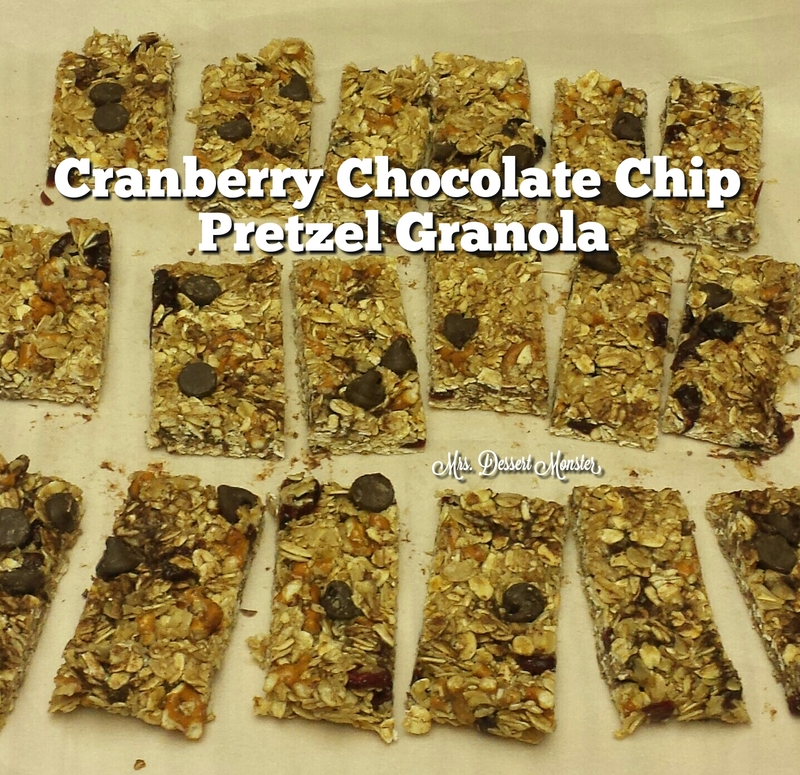 Pour the butter mixture over the toasted oats & add the cranberries and pretzel pieces. Let cool & then add chocolate chips. Stir to combine. Transfer the oat mixture to the parchment lined pan & press into a uniform layer. Scatter some chocolate chips on top & press into the granola. Chill in refrigerator for at least 2 hours. 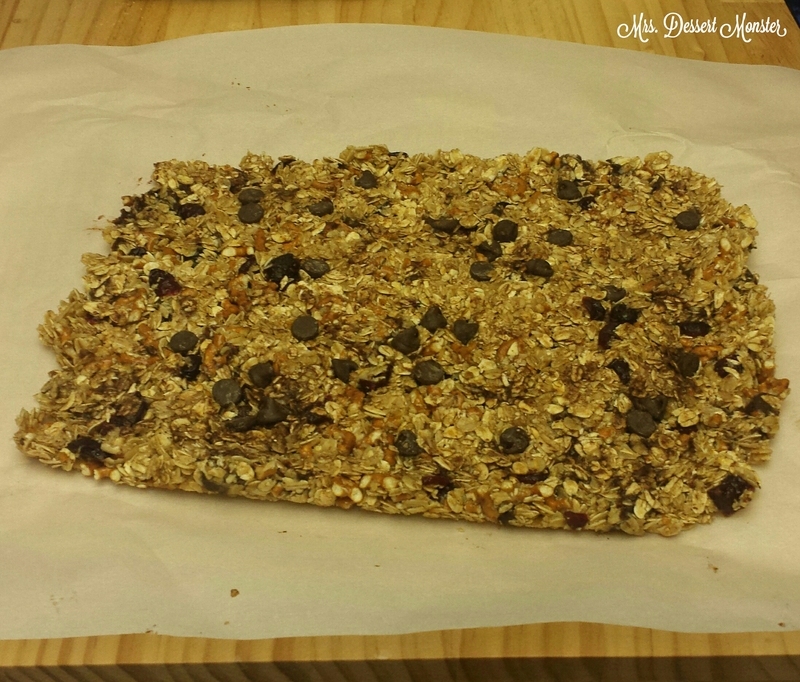 After the granola has chilled completely, lift it out of the pan & cut it into bars. Thanks! It was really easy, too. You should make some for the kiddos!